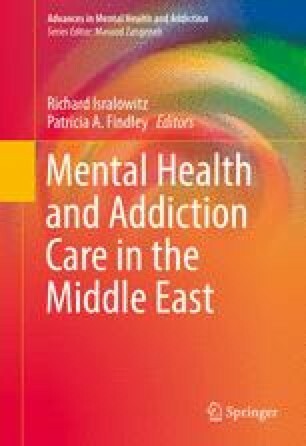 This chapter describes the history of drug use in the Middle East among Israeli and Palestinian people. Information is provided about drug prevention and treatment efforts. From 1997, regional drug abuse information and research centers were established in Israel, the West Bank, and Gaza, with assistance from the United States Substance Abuse and Mental Health Services Administration (SAMHSA) and the Israel Ministry of Foreign Affairs. By tapping into the issue of drug abuse and by focusing on its professional, academic, and community-based dimensions, training programs, workshops, academic courses, and research have been conducted—much has been accomplished, much remains. While many of the efforts generated underscore the dependence of “bottom–up” initiatives because of prevailing political conditions and hostilities, the experience reveals the vital role of nongovernment agencies and academicians working together to provide a safety net to promote and sustain relations and address issues of common concern. This case study shows that mental health and addiction professionals can be instrumental in addressing mutual interests and concerns to promote the quality of life and well-being of people everywhere. The authors of this chapter appreciate the cooperation of numerous individuals and organizations—who came together to make this endeavor possible. The generosity and hospitality of UCLA-ISAP and Friends Research Institute is acknowledged. For the past 20 years, much credit and appreciation needs to be given to Boaz Ayalon of the US Agency for International Development–Middle East Regional Cooperation, US Embassy–Tel Aviv.